Founded by Titanium pioneer George Esseff Sr in 1965, Supra Alloys supplies the Aerospace, Medical, Petrochemical industries, Sport and Recreation industries and more. Supra Alloys has grown to be one of the leading distributors of Titanium in the United States. Proud of its longevity in the Titanium industry, Supra Alloys has grown to be one of the leading distributors in the world. In March of 2015, Supra Alloys became a division of TITAN Metal Fabricators, Inc. TITAN is recognized as the global expert in the design and fabrication of chemical process equipment using the reactive metals and corrosion-resistant alloys such as Titanium, Tantalum, Zirconium, Niobium, Hastelloy, Nickel, Inconel, Monel and the Duplex Stainless Steels. 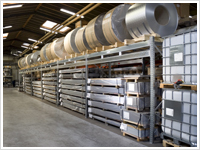 Supra Alloys carries an extensive in-house titanium inventory which includes mill product forms such as plate, sheet, coil, strip, foil, billet, bar, and titanium wire. Material is fully certifiable to orthopedic (ASTM F-136, F167 & F1472), aerospace (AMS, Mil-T), and industrial specifications (ASTM & ASME). A team of knowledgeable, professional sales and customer service people are always ready to assist you with your titanium requirements. Supra Alloys offers prompt quotes, assistance with your technical questions, and immediate status of your orders. SAI is committed to service, reliability, and quality.